Inviting teachers back to the role of reflective advocates for thoughtful reading instruction, this book presents theory and pedagogical possibilities to reclaim and build upon the knowledge base that was growing when government mandates, scripted commercial programs, and high stakes tests took over as the dominant agenda for reading instruction in U.S. public schools. Focusing on literacy learners' and their teachers' lives as literate souls, it examines how the teaching of reading can be reclaimed via an intensive reconsideration of five pillars as central to the teaching and learning of reading: learning, teaching, curriculum, language, and sociocultural contexts. 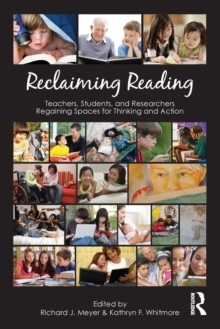 Reclaiming Reading articulates the knowledge base that was marginalized or disrupted by legislated and policy intrusions into classrooms and provides practical examples for taking good reading instruction out of the cracks and moving it back to the center of the classroom. Explaining what happens in readers' minds as they read and how teachers can design practices to support that process, this book encourages teachers to initiate pedagogy that will help them begin or return to the stance of reflective, knowledgeable, professional decision-makers.